On the south side, the secret garden was always the Iveagh Gardens. But in recent years music, comedy and food festivals have meant that that garden isn’t so secret anymore. So these days to find the city’s true secret garden, you have to head north side. Up O’Connell St, then North Frederick, cross Dorset and on up Blessington until you come to the black wrought iron gates. In you go. And you’re there. 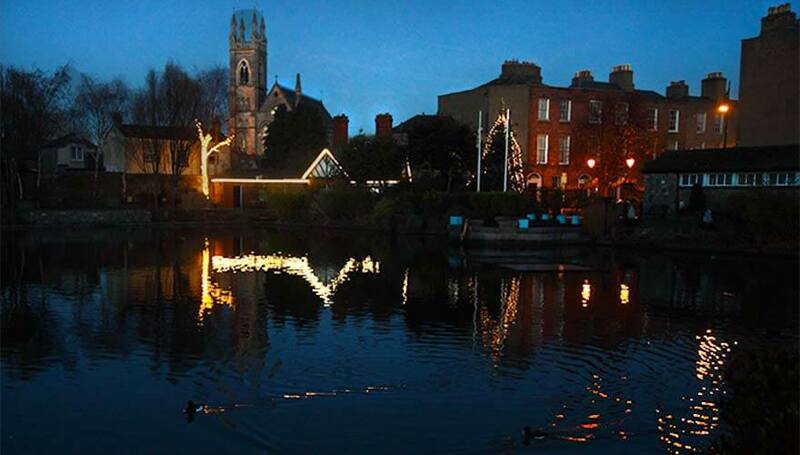 The Blessington Basin, a perfect little gem of a walled park with seats and walkways around the edges of what the locals call ‘the duck pond’. The park is surrounded on all sides by quiet residential areas and the couple of old doors in the walls further enhance the secluded magical feeling. And those lucky enough to live on Geraldine St and Primrose Avenue, which back onto the park, enjoy stunning views. Originally constructed as the Royal George Reservoir in 1810, fed by the Royal Canal from Lough Owel, it continued to supply water to the north side of the city until around 1885. Right up until the 1970s the reservoir also provided water to two of the city distilleries, Jameson and Powers. 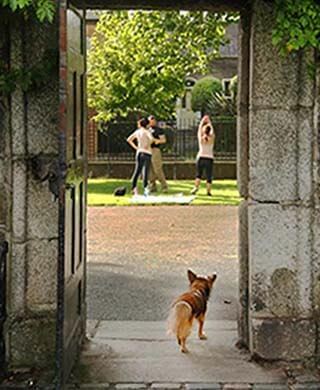 Dublin Corporation subsequently took over the basin and turned it into a public park – albeit one with a ‘private’ feel. But the passing of the years was not kind to the park. “The ravages of time and sporadic acts of vandalism have taken their toll on the former reservoir…” the Dublin Tribune reported in 1990. “Much of the embankment along the water’s edge is subsiding. Iron railings are leaning dangerously close to the water… seating alongside the sides of the reservoir is regularly vandalised… a bricked up toilet provides an unattractive addition…” the paper added. As Dublin played host to European City of Culture in 1991, the Goethe Institute paid for Dieter Magnus, a German “urban repair specialist”, to come up with a new design. But as Gerry Crowley tells us in his history ‘Basin At The Broadstone’, Magnus’ design met with resistance from the locals who cooled on the idea of German generosity. However, it did spur the local residents and businesses on into a flurry of fundraising activity. With added funds from the Corporation and with work provided by FAS trainee schemes and corporate donations of materials, renovations finally went ahead. President Mary Robinson and Lord Mayor John Gormley officially opened the Blessington Basin we see today in late 1994. 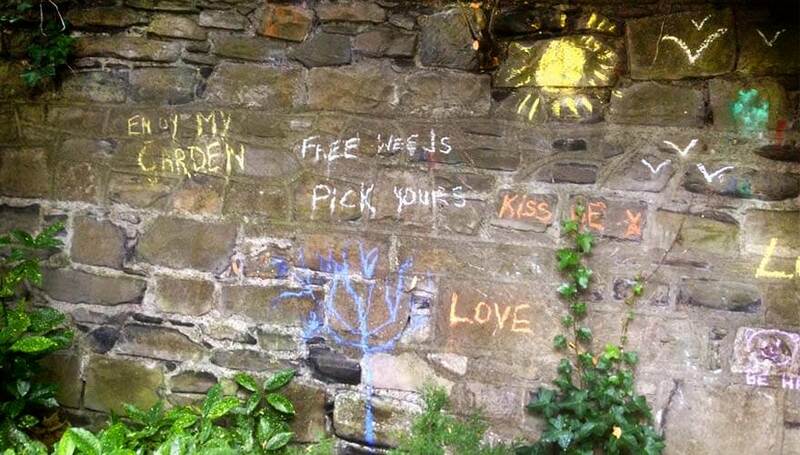 The secret garden was back in business. 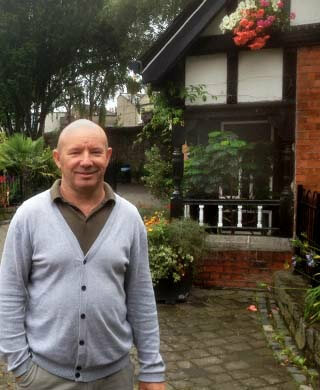 Despite the park’s tranquil beauty it can attract some anti-social behaviour, Parks Manager Ed Bowden tells Dublin.ie. “If people drink in a moderate way and stay quiet and don’t interfere with anybody, we kind of leave them alone because they are everywhere and they’re part of the community too,” he says. We’re sitting in his office in the lovely old period cottage just inside the gates of the park. “But when they get rowdy it can be problematic”, he adds. It seems there is nothing new about the problems presented by the demon drink, local historian Jerry Crowley tells us. The original occupant of the lodge, a predecessor of Ed’s, was a man called William Ferguson. And despite the fact that the city then had some 2,000 alehouses, 1,200 brandy shops and 300 taverns for a population of some 170,000, Ferguson decided to augment his wage by opening a shebeen in the lodge. It wasn’t long, however, before he was busted – leading the corporation to introduce an ordinance specifying that “in future none of the Basin Keepers be allowed sell Porter, Ale or Spirits, at any of the city Basins, nor permit any person to do so, under pain of dismissal.” Ed says that nowadays the majority of people enjoy themselves without incident. The proposed opening of injection centres may also help to reduce anti-social behaviour in the city’s parks. We decide to move on from the folly of man to another more light-hearted subject. The folly of swans! It is not only humans who create the odd chaotic scene, Ed says. The swans are guilty too. “Sometimes the swans don’t make very successful landings,” he says. Swans can only take off and land on water and they need a long ‘runway’. Because of that they can often overshoot their landing spot. “Neighbours will come running around saying there’s a swan caught in their garden or laneway,” Ed says. “Then we have to go out and capture it and rescue it and bring it back into the basin”. A closer look at Dublin’s neighbourhoods Nestled in the wild and bushy hillsides, overlooking the sea in north county Dublin, you’ll find Howth. A world away from the hustle and bustle of the city, it’s one of those precious resorts that make Dublin so unique: a seaside sanctuary for many Dubliners and tourists on the weekends. There are many treasures to be enjoyed here, history, hiking and seafood amongst them. The name Howth is thought to be of Norse origin. ‘Hoved’, meaning head, became Howth over the years. Originally an island, it’s now joined to the mainland in the form of a tombolo, as evidenced by the long sandy beaches. Mentions of Dublin’s Canals, both the Royal and the Grand, pour aplenty through Irish poetry and song. To each canal, a poet’s statue: The Royal has Brendan Behan, turned to look at you if you sit beside him; Patrick Kavanagh is on the Grand Canal, arms crossed and pensive. To each canal, a lyric: the passionate ‘Auld Triangle’ for the Royal; the contemplative ‘Canal Bank Walk’ for the Grand.